“Recently I met up with our Loomy Friend, Bethany Dailey. Not only did we have a lovely looming visit, I purchased a box of her books to give away! 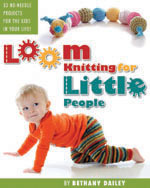 Yip, Loom Knitting for Little People. I am renewing my offer to give away a loverly giftie with a Loom Order for $100.00. This does not include the postage. This is one of my fav loom knitting books. There are lots of looming techniques & loomy tips to learn, as well. Get your book as a gift with your order or order your book through Amazon.com. This entry was posted in Books, Charitable Donations, Loom Alongs, Loom Knitting, Loom Knitting for Little People, Looms and tagged knitting books, loom knitting. Bookmark the permalink. 1 Response to Got yours yet? ?